This is for a costume that I'm making for my friend's 80's party in October; she wants all her girls to be a Madonna from the 80's, so I picked the one from 'Desperately Seeking Susan'. In the movie she has a big drum case that she uses as luggage. I took that idea and made it more practical into a purse. Take your unpainted hinged tin purse, and paint the entire outside black. Once the outside is dry; you can paint the inside pink. Make sure that you have enough coats of black and pink paint, before proceeding to the next step. 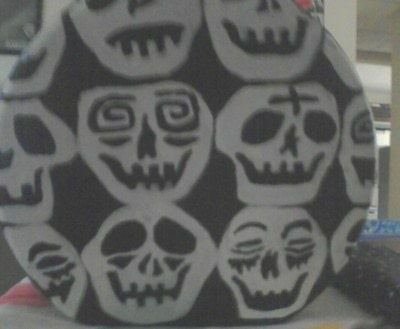 For the outside; you will need a picture of the skulls/skeletons and a piece of white chalk. On one flat side; take the chalk and sketch out the skulls. Paint them white (let dry) and then touch up the details with the black paint. I will work on this week! I love this movie! CAn't wait to see the rest of the how-to. Thank you! You'll prob see the rest of my costume on here as well...working on earring too! Awesome idea for a Madonna party and it looks great!